Roswell is the case that launched a thousands books. And not just books – films documentaries, radio interviews and computer games have all been inspired by this case and the conspiracy theories surrounding it. It is the one UFO incident of which most people, even those who have no real interest in UFOs, have heard. Debate continues to swirl about Roswell. Many claims have advanced by various people over the years and at least some have been shown conclusively to be counterfeit. So the element of fanciful fabrication must always be taken into account. The undisputed facts of the case are compelling enough, however. Mac Brazel came into Roswell Army Air Field, in New Mexico, in the United States, on 7 July 1947. He said that he had found some strange debris close to his home and had brought a few pieces of it to show the authorities. Some military personnel then went with him to the scene to collect the rest of the debris. On the 8th July the press office at the Roswell base issued a press release, saying that base personnel had taken possession of a “flying disk” which had “landed on a ranch near Roswell.” This immediately provoked a storm of interest worldwide. On the following day, a press conference was convened and the public relations staff assured the assembled reporters that it was all a big mistake and all that had been recovered was a crashed weather balloon. For a long time, the official assurance that the original press release had all been a misunderstanding was broadly accepted. Roswell did not always enjoy the place in popular consciousness it has now. It was only in the late 1970s, when Jesse Marcel, an intelligence officer who worked at Roswell at the time of the incident, went public with his confirmation that there really was a saucer crash and the government had been covering it up, that this changed. Roswell rocketed into the popular consciousness again. Books and documentaries began to appear, each adding another layer to the rich tapestry that was being woven on the thin frame of the original incident. Several of those who handled or saw the debris from the crash came forward to say that it was of an extremely unusual nature – that some of the material was wood-like but could not be burned; that other parts were like tin foil but could not be scratched; and that some of it was covered with unusual graphical symbols which resembled Egyptian hieroglyphs. New twists emerged. 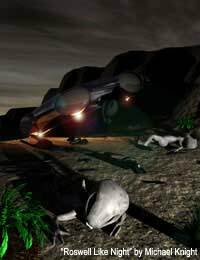 Some claimed there was a second crash site – one that featured alien bodies. Under this scenario, the original debris field found by Brazel resulted from an explosion in the air, while the vehicle itself, complete with alien occupants, crashed elsewhere. New witnesses appeared, some claiming to have seen areas cordoned off by military personnel around the time of the incident. Some even insisted they had seen alien bodies. That the US government was able to reverse engineer technology from the crashed spaceship, allowing it to construct flying saucers of its own and in the more expansive account by Philip J. Corso, it was this alien technology which helped usher in many of the marvels of the modern age such as transistors and microwave ovens! The modern revival of interest in Roswell provoked some official investigations of the incident. These suggested that the mysterious press release may have resulted from a desire to keep the lid on the top secret Project Mogul, a programme whose goal was to create specially-equipped balloons which would monitor air near the Soviet Union for evidence of atomic bomb tests. Under this hypothesis, one of the Project Mogul balloons may have crashed, resulting in the debris found by Brazel. The “flying disk” statement would then have been a cover story designed to draw public attention away from what had actually happened – one that spectacularly backfired. Furthermore, the recent official investigations concluded that the eye-witness reports of alien bodies may have been no more than the sighting of test-dummies used in balloon tests. The Roswell Incident continues to excite the popular imagination. Many of the original witnesses are now dead. Uncle Sam doesn’t show any sign of opening up his secret files any time soon. It is not clear whether the questions surrounding the incident will ever finally be resolved. More probably, Roswell will linger in our collective consciousness as an intriguing mystery for some time to come.